There. I said it. I feel so much better now. Before I queried, the novel started with what I thought of as a Julia Quinn-esque prologue about the Hero of the story. Regency romance powerhouse Julia Quinn has used such prologues multiple times to set up a specific element of backstory that shapes the Hero when we meet him in the story proper. (See, for instance, her Bridgerton series...including THE DUKE AND I and THE VISCOUNT WHO LOVED ME.) And there are lots and lots of historical romances, even new releases now, that employ prologues. But...when I actually began querying agents and receiving partial/full requests, I made a swift and surgical decision not to include the prologue when sending out the requested manuscript. Several agents have blogged about why prologues are often not a good idea. former agent Nathan Bransford jokingly referred to a prologue as "3-5 pages of introductory material that is written while the author is procrastinating from writing a more difficult section of the book." agent Kristin Nelson explained in a podcast why she skips prologues when reading requested manuscripts. 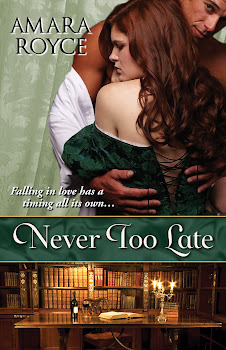 When I took a hard look at my prologue for NEVER TOO LATE, I realized that the story stood just fine without it. The key experience initially conveyed in the prologue was also explained by the Hero sometime in the first half of the book--and perhaps more effectively at that point because it was in his POV rather than in omniscient third POV. So I decided I really didn't need it. Was it a painful decision? Well, yes. I don't think it's a bad prologue. I'm actually quite fond of it. Still, objectively, I felt it wasn't absolutely necessary. Do I think prologues can be legitimately necessary in a novel? Absolutely. But that's a judgment each writer has to make for him/herself...with a clear sense of how and why the prologue works as part of the novel. When the release date for NEVER TOO LATE rolls around in 2013, perhaps I'll consider posting that now-abandoned "Island of Misfit Toys" prologue here as an extra. Perhaps.